A blend of BerriesThis liquid is supplied in a 60ml bottle with 50ml of 0mg liquid.VG/PG Ratio: 70VG..
Bubblegum This liquid is supplied in a 60ml bottle with 50ml of 0mg liquid.VG/PG Ratio: 70VG/30.. 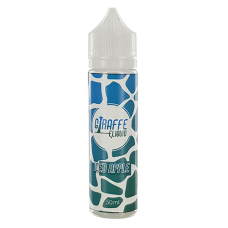 CHILLED BLACKCURRANTS BY GIRAFFE ELIQUID0mg 50ml..
Cloudy GrapesThis liquid is supplied in a 60ml bottle with 50ml of 0mg liquid.VG/PG Ratio: 70VG/30PG..
Iced GrapesThis liquid is supplied in a 60ml bottle with 50ml of 0mg liquid.VG/PG Ratio: 70VG/3.. COOL ORANGE FIZZ BY GIRAFFE ELIQUID0mg 50ml.. Crisp AppleThis liquid is supplied in a 60ml bottle with 50ml of 0mg liquid.VG/PG Ratio: 70VG/30PG..
Energy Ice PopThis liquid is supplied in a 60ml bottle with 50ml of 0mg liquid.VG/PG Ratio: 70VG/30P..
Iced AppleThis liquid is supplied in a 60ml bottle with 50ml of 0mg liquid.VG/PG Ratio: 70VG/30PG..
A classic MentholThis liquid is supplied in a 60ml bottle with 50ml of 0mg liquid.VG/PG Ratio: 70VG/..
Orange SquashThis liquid is supplied in a 60ml bottle with 50ml of 0mg liquid.VG/PG Ratio: 70VG/30PG..
Red Berries SLIGHT MENTHOLThis liquid is supplied in a 60ml bottle with 50ml of 0mg liquid.VG/PG Rat..
WatermelonThis liquid is supplied in a 60ml bottle with 50ml of 0mg liquid.VG/PG Ratio: 70VG/30PG.. Smooth TobaccoThis liquid is supplied in a 60ml bottle with 50ml of 0mg liquid.VG/PG Ratio: 70VG/30P.. Strawberry compoteThis liquid is supplied in a 60ml bottle with 50ml of 0mg liquid.VG/PG Ratio: 70VG..